The Collaborations Workshop (CW) is the Institute’s premier event series. It brings together key members of the research software community: researchers, developers, managers, legal, admin, publishers, funders and leaders and more. Attendees present, discuss, build, make, network and explore key and current areas of the research software landscape. The Collaborations Workshop 2017 (CW17—#CollabW17) will take place in the green City of Leeds at the plush Leeds University Business School, on 27th–29th March 2017. 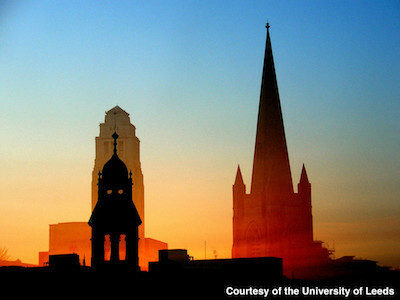 Leeds University was awarded University of the Year 2017. Register for CW17 at Eventbrite. CW17 is focused on the hot topics of The Internet of Things (IoT) and Open Data, both harbour the promise of deep changes to the way we interact with devices and data in the coming years, both also have a clear impact on research and are software driven. To find out more about these key areas, where they overlap, what impact they will have on research and how you might incorporate them into what you’re doing, Collaborations Workshop is your must attend event for 2017. All of this will take place in the unique unconference style format of the Collaborations Workshop series. This includes two-minute lightning talks, discussions sessions on key topics chosen by those attending, the opportunity to group write a blog which we’ll then publish, collaborative ideas sessions where you explore problems and offer solutions, mini-workshops where you can delve deeper into a topic of interest with an expert and a hackday for taking ideas forward where you get to form teams and compete for the generous prizes on offer. On average, people meet 15 new people at a CW event and come away intending to start two new collaborations. There is also a social programme focused on exploring the host city’s location, history and cultural heritage; this also offers more opportunities for networking and enrichment. From learning about new areas, networking, exploring key topics in research software and getting hands on experience with collaborative software writing in the hackday the Collaborations Workshop 2017 offers a unique experience through an efficient and fun method for getting up to speed and exploring collaborations to take your agenda forward in 2017. This year, the Collaborations Workshop (CW16) focussed on Software and Credit. For further information, please see the CW16 report and storify.